America’s premier foreign aid supplier is tapping engineering researchers’ creativity to solve grand challenges from disease to water pollution—upending tradition in the process. For 25 years, Ashok Gadgil has pursued research in technology to foster healthier lives for the poorest of the poor, “scraping the bottom of the barrel” to fund his work. Government agencies had little interest in supporting academic experiments on innovations for developing countries. The one time that the U.S. Agency for International Development did fund his proposal, says the University of California, Berkeley, civil and environmental engineering professor, a USAID program manager had to “fight the bureaucracy” to win approval for such an unconventional grant. That award barely covered lab supplies. “USAID was interested in deployment rather than in research,” laments the director of the Gadgil Lab for Energy and Water Research. But in recent years, Gadgil has enjoyed a front-row seat for USAID’s foray into technological research as faculty director of the Development Impact Lab. Created in 2012 with a $20 million USAID grant and millions of dollars more from Berkeley and its partners, the lab has drawn 36 of his colleagues into the search for solutions to some of the world’s most pressing problems while sending more than 100 Berkeley students to developing countries to test prototypes, find collaborators, and study the market for sustainable technology. This drive has brought the language of Silicon Valley—“venture capital,” “crowdsourcing,” “an appetite for failure”—to the agency’s headquarters on Pennsylvania Avenue near the White House. USAID even hired Google engineer Ann Mei Chang as its Chief Innovation Officer, running the U.S. Global Development Lab formed in 2014 to manage many of these programs. The academic core of the Development Lab is the Higher Education Solutions Network (HESN). Berkeley and six other universities—Michigan State, Texas A&M, Duke, Makerere (Uganda), William & Mary, and MIT—were chosen in 2012 for their expertise and commitment to a multidisciplinary approach to development innovation. Each was funded for five years to support centers like Berkeley’s Development Impact Lab, though each has a different emphasis. MIT and Berkeley have the most engineering-heavy initiatives. While HESN works with well-established institutions, another USAID program—also launched in 2012—approaches the same goals from the bottom of the pyramid. Partnerships for Enhanced Engagement in Research (PEER) funds individual researchers in developing countries who have ideas they can apply locally. Cameron Bess, senior research adviser for the program, says that the mantra of PEER is “Great ideas are everywhere, but resources are not.” Competition is stiff for the 30 to 50 PEER grants issued annually. This year some 600 applicants approached USAID for the three-year awards. Each developing-country researcher must partner with a U.S.-based academic who has a grant from a federal agency. In one PEER partnership, Antoine Ghauch, a chemist at the American University of Beirut, Lebanon, found that the opportunity to travel and work in Berkeley’s environmental engineering water labs triggered a cascade of ideas. In the lab, he evaluated water-treatment chemicals using liquid chromatography. He knew that water-treatment facilities back home could never afford the hundreds of thousands of dollars needed to buy such equipment, but after learning about phosphorimeters at conferences, Ghauch hit upon the idea that the device could be adapted to monitor public water supplies for a small fraction of the cost. When the first prototypes did not prove sensitive enough for minute concentrations of chemicals in drinking water, Ghauch stretched the idea further. He rejiggered the device to detect counterfeit money impregnated with fake phosphorescent watermarks that could evade detection under ultraviolet-lamp screening. Now he is in discussion with companies that might commercialize the technology. “Antoine took the idea and ran with it,” says his American partner, David Sedlak. Now that the three-year grant is ending, the pair is applying to PEER again so that Ghauch can refine his design into a water-monitoring device so affordable and portable that it could be used in refugee camps in Lebanon and around the world. USAID also stimulates innovation on certain critical topics with Grand Challenges for Development, which offers prizes for breakthrough solutions that address Ebola, off-grid energy, irrigation, power for agriculture, and other issues. The competitions are open to engineers, organizations, and companies worldwide. The Powering Agriculture challenge, which is also supported by Germany, Sweden, and North Carolina-based Duke Energy, attracted 1,346 applications in two rounds, with 24 winners receiving $500,000 to $2 million each to further develop their ideas. Shelby, a mechanical engineer by training, leads USAID’s Powering Agriculture team. He wants to see several of the technologies funded in this crowdsourcing effort reach commercial scale, with at least $1 million in revenues. “We want to benefit not tens of people but tens of thousands,” Shelby says. Winning ideas must run on their own power, independent of grid electricity and diesel fuel. This makes sense to University of Georgia engineer William Kisaalita, who grew up in Uganda, where grid electricity reaches less than a fifth of the population. Milking his parents’ cows as a boy, he also learned that in Africa, much milk spoils before smallhold farmers can get it to market, so he designed the EvaKuula, which can preserve milk for a day. The two-step process first gives the milk a mild, 58-degree Celsius heat treatment and then chills it in an evaporative cooler. The fuel for the microbe-killing heat comes from a biogas digester fed by cow dung. The cooler uses a wind-powered turbine ventilator—commonly used on roofs—to pull air across wetted charcoal pads. Kisaalita, winner of the College of Engineering’s Instructional Award, says that the $1 million challenge grant was a “game changer.” It allowed him to build and test prototypes with farmers in Uganda. There, he saw technical problems that forced a redesign and heard farmers say they wanted a bigger cooler that would accommodate the herd they aspired to, not just the one or two cows they possessed. “The [USAID] money is large enough to be able to fail, get up again, and take you to the finish line,” he says. After field testing a couple of devices, Kisaalita expects to have 50 farmers using purchased EvaKuulas by December and 500 more in the coming year. His data suggest that even if a farmer uses only a fraction of the device’s capacity, improved milk sales could cover the purchase costs in 18 months. Finding a sustainable funding model that will allow the desalination plants to pay for themselves may be more complicated than the technical challenge of building the pilot. With assistance from staff and students at the Polytechnic University of Engineering in Tegucigalpa—which received $25,000 from USAID as the local partner—Cappelle is bringing Honduran farmers to the demonstration site to teach them how it works and survey their needs. “They had lots and lots and lots of questions about how expensive it would be,” says Cappelle, who notes that many of these poor farmers currently rely on rain alone. The engineers are squeezing operating and construction costs wherever they can. Relying on solar power pressured the engineers to cut power requirements from 3.4 kilowatts to as little as 2 kilowatts, design savings that can be transferred back to grid-connected U.S. desalination plants as well. As in Silicon Valley, where “investors put money in seven companies knowing six are going to fail,” notes Kisaalita, most of these funded ideas will never reach the scale needed to make a difference globally. “But the one that succeeds makes up for the six.” A team of biomedical engineering students from Rice University is well on the way to being that standout. In 2011 they received a $250,000 USAID seed grant that allowed them to conduct a successful clinical trial on the inexpensive breathing machine for premature babies they had built from a modified aquarium aerator pump. After saving many lives in a single hospital in Malawi, their bubble Continuous Positive Airway Pressure (bCPAP) device is now being manufactured and marketed by California-based Hadleigh Health Technologies, which has sold the device in 20 countries. USAID also has programs that strengthen engineering schools overseas, leaning on the expertise of U.S. universities. In Liberia, Rutgers and the University of Michigan are playing a role in rebuilding the engineering school at the University of Liberia. And in the Philippines, the agency is spending $32 million on a program encouraging private-sector partnerships that will orient academic research toward the challenges facing the country. Andrew Baird has been running both of these projects under contracts USAID has with RTI International, a product of North Carolina’s Research Triangle. Baird says that university research “has been ivory towerish,” in the Philippines, “disconnected from the daily research needs of industry.” To rectify the problem, RTI has partnered with Florida State, Rutgers, and Michigan’s Davidson Institute, with multiple exchanges of faculty and students crossing the Pacific in both directions. Academic engineers working to transform vulnerable lives around the world hope that USAID’s support will not be a passing fad. Gadgil argues that even the five-year grant that has supported Berkeley’s Development Impact Lab is fleeting. “From an idea leaving the whiteboard or notebook to making impact in the market, the typical time is 15 to 20 years, even in modern corporate America,” he says. 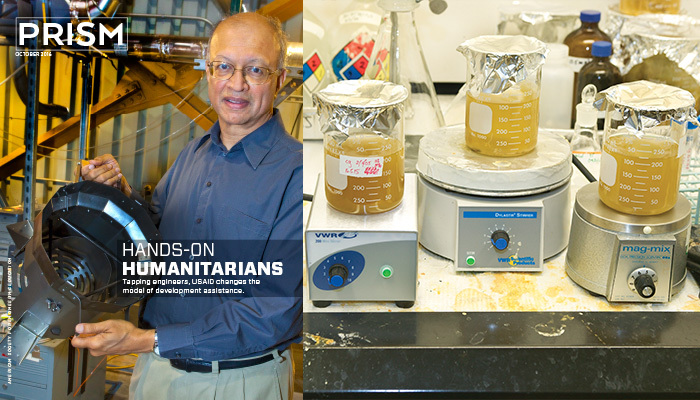 Gadgil doubts his development lab will survive if the USAID grant—now entering its final year—is not renewed. USAID recently released an evaluation of the first three years of HESN that cautions its $140 million budget is “difficult to sustain.” Yet research surveys in the report point to many successes. HESN Labs surpassed a range of targets by an average of 66 percent, and 90 percent of participants surveyed said the support had benefited their work as intended. The report recommends that the agency continue to fund “core critical operating functions and costs” for university recipients, which in turn should identify a limited number of activities with the greatest potential. Don Boroughs is a freelance writer based in Washington, D.C. He previously reported for Prism from South Africa. Cover image courtesy of the Lawrence Berkeley National Laboratory.